Every December when I was a kid, my mom would make something that we called “Christmas Fragrance”. This was a combination of water, black tea, orange peel, cinnamon stick, cloves, and I think there may have even been some Tang in there. (Does anyone even remember that stuff?) She would combine all the ingredients in a saucepan, and just let it simmer on the stove for hours, adding water as needed. It would infuse the house with such a great aroma. I will occasionally mix up a batch at the holidays and fill the house with warmth and memories. I wanted to capture that feeling in a liqueur, and here is my attempt… Tang NOT included. I infused all of the above for about 3 weeks. The result is very flavorful, potent and tasty. I think it will be good on its own (in small quantities) as a digestif. We haven’t tried it in any cocktails yet, but it would probably be good in some warm spiced cider. 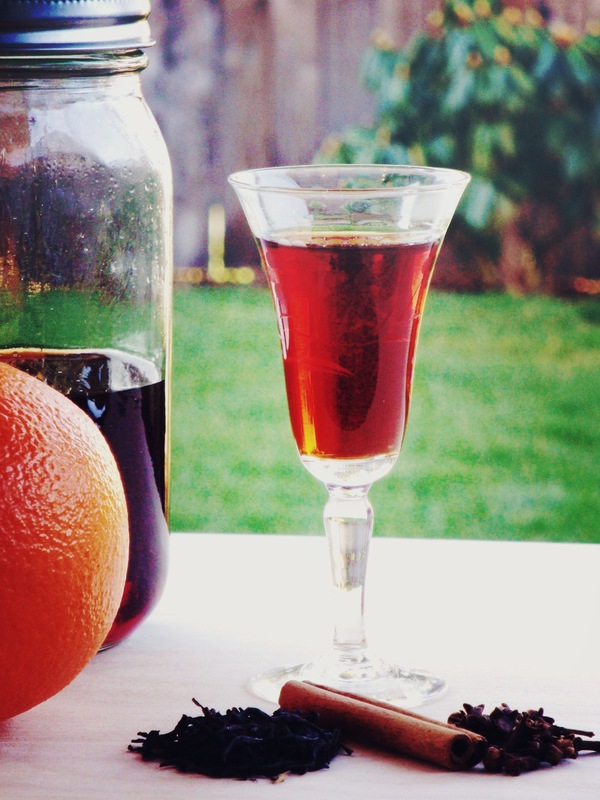 Categories: Liqueur, Recipes | Tags: brandy, cinnamon, clove, orange, tea | Permalink. Do you have any measurements for this? Thanks. Hi Jake, yes! Thanks for the suggestion, I just edited the post to include measurements of all the ingredients. Cheers! Tamsin, that sounds fantastic! I love making a big batch of liqueur and gifting for the holidays. Yes, you can certainly increase the ingredients to make a large amount. And Specialty Bottle has some great little bottles (try the 5 oz. woozy bottles) and can be ordered online. You can even get plastic bands to heat-shrink around the cap. Happy Holidays! I hope you like it! You are an expert at this by now!! Filtering can be tedious and time consuming. Do you have have a jelly bag? I really think it helps. A canning funnel is also nice. I like to use that with the coffee filter phase. Cheers! Wow – just found a tiny jar of left over Winter Spice Liqueur I made last Christmas at the back of my cabinet. It’s amazing! If only it weren’t Friday morning… must wait until 5pm. Must wait until 5pm. Hey I love your blog – I have 5 different recipes in the works as we speak (xmas gifts planned). Question about the winter spice liqueur – after each of the first 3 days it’s tasting like bubblegum. Did you run into this or do you have any suggestions how to alter? Thanks so much. Hi Emily, I am not sure why it would taste like bubble gum. Often times the flavors will continue to change even after you pull the infusing ingredients out. But I don’t recall mine ever having that flavor. What type of tea did you use? That could be the culprit. Is this intended for a holiday gift? Do we need to figure out a remedy before the holidays? Thanks so much for getting back to me! It was going to be a holiday gift, but it might be beyond saving (which is fine, I have others brewing). I used a dark english tea. I pulled the orange yesterday and will wait to see what happens, although I’m open to suggestions. Just whipped up a batch of the winter spice brandy! It’s so tasty! Great with cigars on a cold winter night up here in oneida NY. Thanks for the recipe! I totally recall that holiday “Christmas Fragrance”. Back in the 70’s it was a common holiday gift using Tang. I think it was called Russian Tea? While I had a love affair with Tang back in the 70’s, today I prefer to use natural ingredients. I so look forward to trying this out. I used this last winter to make some Winter Spiced Old Fashioneds…. VERY tasty! It was also fantastic in my flask at our company Christmas party on the tubing slopes! This summer we picked up a bunch of cherries and infused them with various boozes, this being one of them, and it’s definitely one of my favorites! The winter spiced cherries are great additions to Manhattans! Oh wow, you may have just blown my mind! Winter spiced boozy cherries sounds absolutely amazing! Thanks for sharing! So I have a bit of a problem, I made this for some friends and they promptly drank ALL of it in under 20 minutes. It was just too damn good. I’m hoping to start another jumbo batch, but I don’t know how to scale the ingredients. If I make double or triple the amount, should I just double or triple each ingredient or…? John, that sounds like a pretty good problem to have! Yes, if you are doubling, tripling, etc the recipe, just increase all of the ingredients in the same proportions. If you are using 10 times the amount of alcohol, then use 10 times the amount of all other ingredients (especially since you liked how it turned out). Sounds like you will have a fabulous holiday season! I want to avoid the “bubble gum” incident. What kind of black tea do you suggest? Hi Lisa, I would suggest using just a simple black tea with no added flavors or ingredients. I used a Russian morning tea and it was great. English Breakfast would probably be perfect.